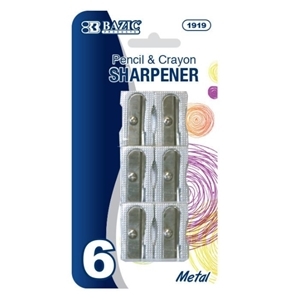 Package Includes: 1x Single Hole Best Quality Metal Pencil Sharpener - 6 per pack. Made with the Best Quality Material. Metal sharpener is very strong and durable. Sharpener accommodates regular sized pencils and crayons. Less breakage of lead for extra sharp pencil point. Package Dimensions: Height: 4.00 inches, Length: 6.00 inches, Width: 5.00 inches.